Although I’ve been sewing since I was a wee child and my grandma taught me how to make my first pair of potholders, I’ve always been a little bit terrified of sergers. All the threads, all the dials, it just seems like there is too much that could go wrong. Plus they can cut the fabric! So the margin of error just seems so small, I’ve avoided them thus far. And yet, I want one! For sewing clothing and finishing edges, they’re kind of necessary once you want to go beyond the basics and make a more professional looking, durable product. When I first began making my own clothes and whatnot, sergers just seemed totally inaccessible from a financial standpoint, but now since they’ve come way down in price, and in size, I am even more drawn to the idea of getting one and upping my sewing game. 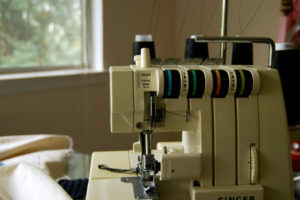 Because I’m new to the serger world, I’ve done a bunch of digging to come up with my list of the 5 best sergers for beginners.